We know it’s tough to battle it out with all the moms and tweens at the mall to find that perfect gift for your friends and family during the holiday season! Well not to worry because as usual, Sneaky Dee’s has got you covered! We have gift cards (available only online) and some super rad holiday bundles available for a limited time! Get your hands on one of two Holiday Bundles before time runs out! – Holiday Bundle #1 includes a Sneaky Dee’s Zip-Up Hoodie, a $25 Gift Certificate and a special Sneaky Dee’s Koozie for only $65! 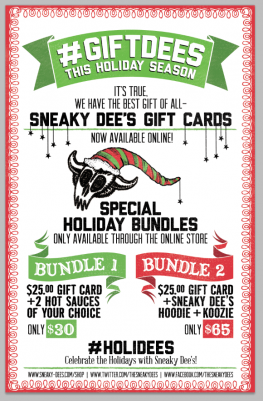 – Holiday Bundle #2 includes a $25 gift card and two Sneaky Dee’s Hot Sauces of your choice for only $30! Head to our online store now and don’t miss out on these awesome deals!